Justice Tendai Uchena, Dr Tarisai Mutangi and Petronella Musarurwa. Commissioner Heather Chingono; giving land barons a torrid time. GREAT ZIMBABWE HOTEL – The Zimbabwe Defence Forces Benefit Fund (ZDFBF) paid a cool $1,6m for 550 residential stands to Benjamin Musara, a man described by a Government appointed Commission as a land baron illegally selling State-owned land in Lot A of Victoria Ranch in Masvingo for selfish gain. 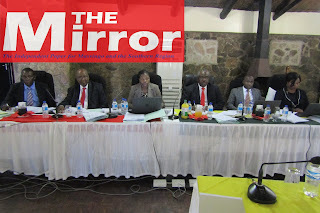 The Justice Tendai Uchena chaired Commission had to ask Musara who is a younger brother to Chief Musara also under investigation for various other land deals to stop lying under oath and questioned his level of education when he became evasive to searching questions thrown at him by Commissioner Dr Heather Chingono. The Commission of Inquiry into the matter of sale of State land in and around urban areas since 2005 was appointed by the President in 2017. 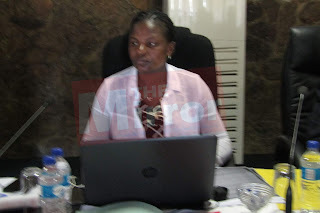 Musara whose companies earned more than $2 million at Victoria Ranch alone appeared at the Commission’s court that is sitting at the Great Zimbabwe Hotel in Masvingo Rural last Friday. 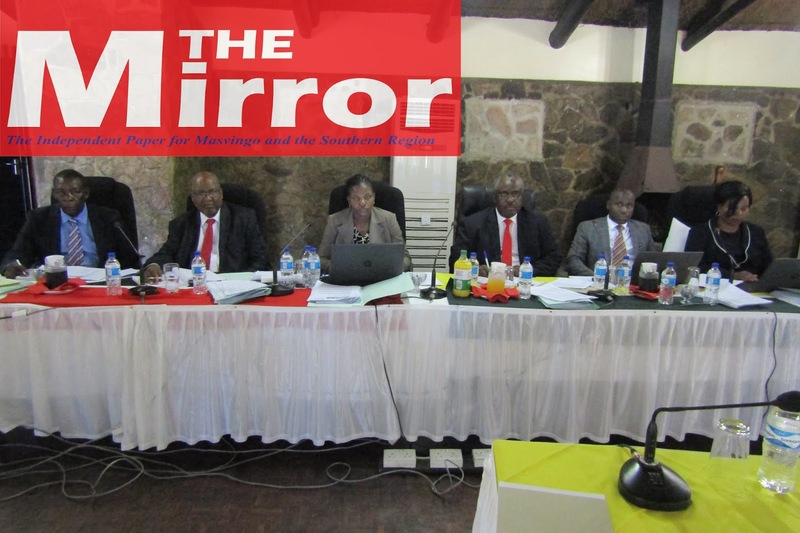 Residents, stakeholders and land developers are giving evidence on the sale of State Land in Masvingo Province and the court started sitting last week and will go on until October 27, 2018. Musara who is using three companies to do business in the projects namely Wallben, Hydraben and Hydrabuilt confirmed to the Commissioners that he was paid $1,1 million from ZDFBF after selling 350 stands and a further $500 000 for selling another 200 stands to the same organisation. Musara is running a scheme with 1 000 residential stands in Lot A of Victoria Ranch after being allocated 500 stands by the Ministry of Local Government Public Works and National Housing on February 8, 2012. He got a further 500 stands to run on behalf of Phainos Makwarimba of Isolec Private Limited who was allocated that number of stands by the Ministry. Both Musara and Makwarimba’s stands were allocated to them on the same day on February 8 2012 through Masvingo Rural District Council and they received them without paying a cent. The court queried the fact that Makwarimba is the son of Senator Clemence Makwarimba who was the then Chief Executive Officer of Masvingo Rural District Council under which Victoria Ranch falls. The Commissioners put it to Musara that Isolec was just one of the many companies he created for purposes of amassing State land. Dr Chingono put it to Musara that he was a greedy and selfish person who subverted a Government project for personal gain. It was also noted that Musara is a shareholder in another land development company, Gorges Safari that is owned by Chief Musara. Some land beneficiaries including Owen Bero came forward to court to complain against Benjamin over land deals that he made at 2020 Lot 2 of Clipsham and then went sour. The Infrastructure Development Bank of Zimbabwe (IDBZ) is now involved in the Clipsham stands, a development that is also being scrutinised by the Commission. The Commission’s mandate is to look into the illegal sale of Urban State land allocated through the Ministry of Lands, Agriculture, Water, Climate and Rural Resettlement between 2005 and now, the settlement on that land, the actors who facilitated the settlement; the developments made, including construction of roads, building of sewer and water systems, schools, clinics and the provision of electricity. After completing its work, the Commission will submit a report to President Mnangagwa who will act on the findings and recommendations made thereof. Commissioners noted that Musara sold most of the remaining stands in bulk to ZimTrust, Zimbabwe Prison Services, Zimbabwe Housing Project, Shineplus Housing Development Trust and Enop. Musara who is of 297 Borrowdale Road in Harare could neither produce his application nor offer letter to the Commission. A lot of the documents that he brought before Commission including financial statements were dismissed as unauthentic and he was given five days to go and bring correct documents including bank statements from the time that the company was started. Musara who preferred to give evidence in Shona started off confidently but balked and collapsed in his line of defence midway through the hearing. He became confused, stammered and contradicted himself as commissioners poked holes into his evidence. “What if I put it to you that Isolec is just one of the many companies you created to amass State land. Isolec and Wallben are twins whose applications for land were made on the same day, submitted same time and used the same application letters. Look at the similarities in these documents including their spelling mistakes, gramma and wrong brackets. You and Makwarimba are just one,” declared Dr Chingono. At that point Musara shifted his position and said he indeed did documents for Makwarimba’s company. He said he provided consultancy for Makwarimba. Pushed yet further, Musara could not dispute the fact that he was an agent selling Makwarimba’s stands. Although he vehemently refuted at the beginning that he was selling State land for a profit, Commissioners asked to him to read aloud the letters which he wrote to buyers of his stands. Several documents were produced in which Musara claimed that the stands belonged to his companies and not the State. The Commissioners also produced Musara’s annual financial statements showing profit and loss he made from selling the stands. “May I know your level of education? What you say does not resonate with someone who got up to Form 6,” noted Dr Chingono. “Ndinourombo, ndaingoita nokusasiziva. Izvi ndakazviita nguva yandanga ndisingasevenzi ndichitsvaga chokuita. Asi ndinotenda kuti zvakandibatsira nokuti ndave nemaprojects akawanda ku Gwanda nekuHarare neequipment zhinji yekuitisa basa. I am sorry, I agree that I was selling State land for a profit. I did this when I was unemployed and looking for something to do. I however, think that this helped me a lot as I am now big land developer with projects all over the country including Gwanda and Harare among other places,” said Musara. The Commissioners thanked him for giving evidence and told him that a report will be produced and given to the President who will decide on what to do with it.